Almost twenty years ago, Getting to YES revolutionized the way we think about negotiation. 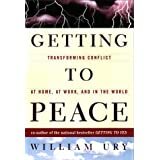 Now, on the verge of the millennium, bestselling author William Ury tackles the most critical challenge facing all of us: getting to peace. In our rapidly-changing workplaces, stressed-out families, and violent world, we need cooperation more than ever and yet everywhere destructive conflict poisons our relationships and our communities. How can we learn to deal with our differences without going to war? Is it humanly possible? In Getting to Peace, Ury challenges the fatalism that is so fashionable. Using new archeological and anthropological evidence, he overturns old myths about human nature and offers a new and hopeful story about human conflict. He suggests a powerful new approach for turning conflict into cooperation which he calls the “Third Side.” For in every dispute, there are not just two sides, but a silent third side that can help bring about agreement. By discovering the ten roles of the third side, each of us can act as teachers, healers, and mediators to achieve fair and non-violent conflict resolution. Our happiness at home, our productivity at work, and our very lives depend on Getting to Peace.